When AP McCoy first became Champion jump jockey in 1996, Roger Federer had never won Wimbledon and Damon Hill was crowned Formula One world champion. 19 years later, and AP McCoy OBE is still unbeaten in his field. He is set to become Champion Jockey for a record breaking 20th consecutive year. After riding over 4300 winners in his phenomenal career - including the 2010 Grand National, the prestigious Cheltenham Gold Cup, Champion Hurdle, Queen Mother Champion Chase & King George VI Chase - this incredible man and BBC Sports Personality of the Year continues to break all records and set new ones. And still he goes on, a tribute to his stamina, endurance, motivation and dedication to the world of sport. 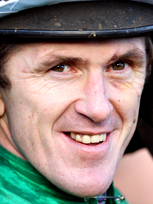 A BBC-backed full length feature documentary on AP McCoy, was shown in over 200 cinemas around the UK in October 2015, celebrating his remarkable career and success. “Being AP” delivers a rare and intimate glimpse into the life of a champion performing at his peak. He is a regular contributor on Channel 4 Racing, Sky Sports, The Morning Line, on BBC TV and TalkSPORT. He has a weekly racing and football slot on BBC Radio 5 Live. 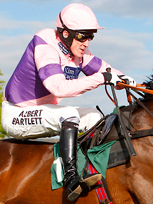 AP is also William Hill’s official ambassador and the Face of the Cheltenham Festival. He is a knowledgeable fan of all sports and has appeared on programmes such as A Question of Sport, ESPN, Setanta Sport, Sunday Brunch and Soccer AM. AP has published a fictional novel called “Taking the Fall” and his autobiography has received acclaim throughout the sporting and non-sporting world. While time takes its toll on every individual on the face of this planet, it seems to have excused one man. AP is a fantastic ambassador for sport (as well as business) and his after-dinner speaking and Q&A sessions are sensational. He can provide motivational talks that are inspirational, leadership talks on how to be the best and remain the best, he unveils his fear of failure and the drive he possesses to be one of the greatest sportsmen we will ever see. He can also combine sport with business. AP has broken bones over 700 times, the dangers and pressures he has faced every single day for over 20 years merely serves to illustrate his humility. His anecdotal stories are like no others and they often leave guests astounded and humbled by AP. He also has a very dry sense of humour and is admired and respected by everyone in the world of sport and business. "Being AP" is an intimate documentary portrait of AP who risked life and limb in his determination to place his winning record out of reach of future challengers before he retired. He has also written autobiographies such as "Winner: My Racing Life" and a fictional book "Taking the Fall".